Thrive Chopped Chicken makes this versatile food even easier to enjoy! Toss these delicious, pre-cooked dices on top of rice and noodle dishes, or use them to make a barbecue chicken pizza that everyone's sure to love. 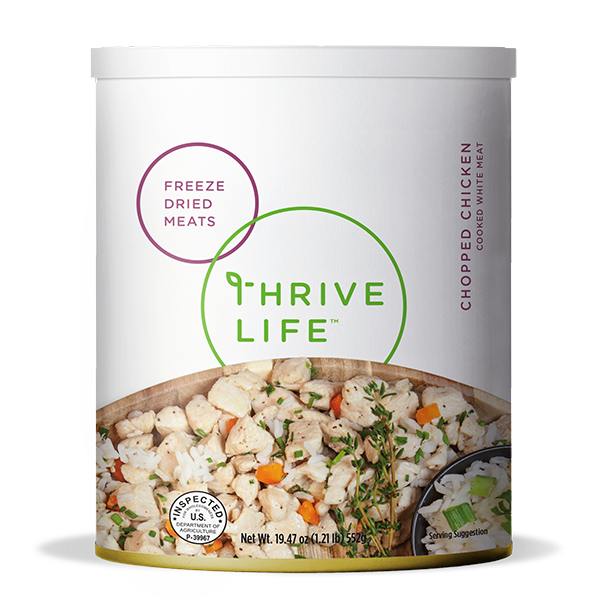 Thrive Chopped Chicken is made exclusively from white meat. Add 1/2 cup warm water to 1 cup Chopped Chicken; cover and let sit for 15-20 minutes or until tender. Chopped Chicken is diced smaller than our Seasoned Chicken slices, perfect for pastas, soups, salads, and more. Out of pepperoni? Top your pizza with Chopped Chicken and barbecue sauce instead!